Centric vs. Brembo: What are the Best Brakes? Find out who makes the best brakes: Centric or Brembo. Whether you’re doing laps at the track or cruising down the highway, you want the confidence to know that you can stop on a dime. That’s why you need to upgrade your braking system to a high-quality system from one of the top names in the game, like Brembo or Centric. With an upgraded braking system installed, you’ll get the stopping power, style and performance you demand. So, now that you’re ready to upgrade, you need to decide what the best system for your ride is. Here’s the lowdown on everything you need to know when comparing Centric and Brembo brakes. Regardless of whether you drive an ultra-performance vehicle or an everyday commuter, Centric brakes deliver the braking technology your ride needs. Founded in 2000, Centric has earned praise from racers and enthusiasts for more than 10 years. Centric continues to push the envelope in research and development by employing only the most skilled and seasoned experts from across the industry. All Centric brakes have been made with the highest-quality materials and superior craftsmanship. For high-quality, affordable brakes, check out Centric Premium Rotors. Made to meet and beat all OEM and quality-assurance standards, these Centric rotors ensure safe braking without breaking your budget. Crafted with premium Centric rotor quality, these replacement rotors are electro-coated for long-lasting corrosion protection. And, their premium finish delivers quieter, smoother stops. With more than 45 years in the braking industry, Brembo knows what it takes to design an effective braking system. A long list of elite motorists turn to Brembo when they want the most trusted expertise in braking technology and performance. In fact, if you check behind the wheels of real racecars, you’ll find only the best—Brembo rotors and brake pads. Whether you’re looking to replace your whole braking system, or you just want to pick out new pads or calipers, Brembo has exactly what you’re looking for. And, all Brembo brakes are custom-made to fit your exact year, make and model. So, check out Brembo for your Toyota Tundra or your Chevy Camaro, and be certain you’re getting the best fit possible. At the track or around the block, the Brembo Gran Turismo Drilled Brake Kit delivers the stopping power your ride needs. Complete with everything you need for a complete brake system rebuild, this Brembo brake kit includes cross-drilled discs, aluminum calipers, braided stainless steel brake lines long-lasting brake pads and aircraft-quality hardware. Plus, it’s built lightweight for maximum vehicle performance. 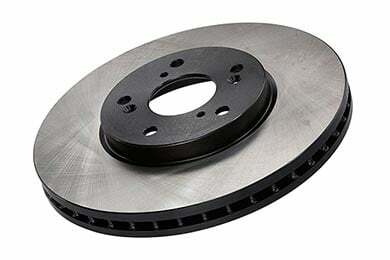 What are the Best Brakes for Your Vehicle? When deciding between Centric or Brembo, you need to evaluate exactly what your braking needs are. If you’re looking for the longest wearing and cleanest brake pads for your everyday commuter, check out the Posi Quiet Ceramic Pads. 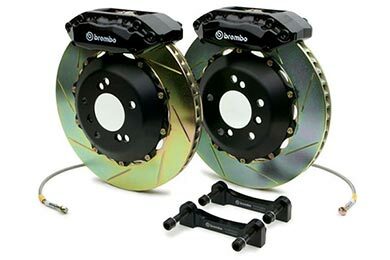 If you want a complete system for your speed-machine, check out the Brembo complete brake kits. We also have plenty of brake reviews on our site, be sure to give them a read! Reference # 759-609-735 © 2000-2019 AutoAnything, Inc.